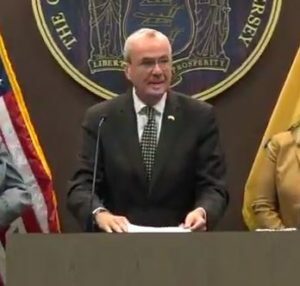 Today, Governor Phil Murphy declared that New Jersey will enter a state of emergency beginning tonight at midnight ahead of the winter storm, which is expected to start tonight and continue throughout the day tomorrow. Executive Order No. 55 declares a state of emergency across all 21 counties in New Jersey, allowing resources to be deployed throughout the state during the duration of the storm. New Jersey is expected to experience several inches of snow and some icing throughout the northern and central part of New Jersey. There may be a potential wintry mix of snow and sleet that may transition to rain in southern parts of the state. In preparation for the winter storm, the New Jersey State Police will activate the State Emergency Operations Center tonight in order to monitor the storm. The New Jersey Department of Transportation will also deploy more than 2,500 plows and spreaders to keep roads and communities safe. There are 3 Comments to "VIDEO: Governor Murphy declares state of emergency ahead of storm"
This is so frustrating. This means only crucial vehicles on the roads. I mean, how am I supposed to go to my next Kumzitz appointment. No, I can’t do it over the phone !! When Murphy is the governor we are definitely in a state of emergency. he is correct it is a state of emergency since he legalized drugs!